Compatible with smartphones, tablets and other Bluetooth transmitting devices. Built-in lithium battery 2,000mAh for up to 6 hours play on one charge offers you hours of listening pleasure. Multi-colour LED's light up as you play music and change according to your music selection. Play music from the Micro SD card slot, USB port or 3.5mm audio jack (via the adapter cable supplied). Listen to your favourite radio stations. IPX5 water rating will protect your device from water jets in any direction. Allows you to answer and make phone calls whilst paired to your phone. What is the difference between Bluetooth 3 and Bluetooth 4? Bluetooth 4 is a format of Bluetooth that is largely more power efficient compared to Bluetooth 3. The battery life can almost be measured in months and years rather than hours and days. This is the most commonly used profile, providing support for Bluetooth speakers to be used with mobile phones. It offers the ability to ring, answer a call, hang up and adjust the volume direct from your portable speaker. This allows the user to answer calls from a mobile phone and to speak directly into the speaker, as compare to into the mobile phone. The Advanced Audio Distribution Profile is a Bluetooth profile that allows for the wireless transmission of stereo audio from an A2DP source (typically a phone or computer) to an A2DP receiver (a Bluetooth speaker or stereo system). 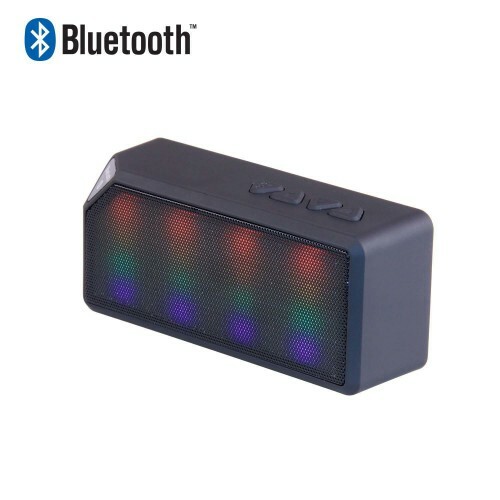 Move to the beat and light up your life with this Wireless Speaker with LED Lights and FM radio. Colour's change with your selection of music in LED-pulsed rhythms. Splash-proof with up to 6 hour battery life, this device is perfect for those in need of a compact and portable speaker for all occasions. Whether you are using it by the pool, at a party or with the family camping, this portable device can turn any space into a party.